Smartmatic president, Antonio Mugica, was interviewed by Tal Cual. On the interview, he says they knew, at NOON of August 15th, the NO would win. If there was a massive turnout, most voting centers didn’t open until 0700hs or 0800hs, and we had lines of people waiting to cast their votes until 0300hs THE NEXT DAY, how come this man says they already knew the outcome of the referendum? Moreover, no voting center had closed at noon, so none had transmitted any results. Did Smartmatic carry its own exit-poll? 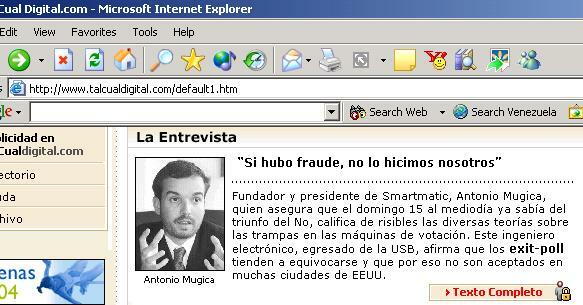 Posted in Uncategorized | Etiquetado: Uncategorized | Comentarios desactivados en Smartmatic foresees the future. According to Descifrado, italian news outlet RAI carried an informal survey amongst street vendors at Sabana Grande Boulevard. These vendors are not what first-world leftists may call oligharchs, and yet, 7 out of 10 believe there was a fraud on the Aug. 15th referendum. They also say they voted SÍ, but are already resignated, for they still have to go out, put up their kiosks and try to sell their stuff. Some whys, some wheres, some hows. Francisco, Daniel and Miguel have already pointed out their own questions, so mine are not going to be that different. Why Carrasquero announced, early Monday, that the NO option had already gotten 4,991,483 votes, and on the same afternoon the NO votes “shrunk” to 4,917,279 votes, only to “stretch” again – today – to 5,553,209? Why Carter said the OAS/CC mission were allowed into de tallying room, and a couple of minutes later Gaviria said they weren’t? Why two of CNE directors, Zamora and Mejías, were not allowed into the tallying room either? How come four – or more – different exit polls were giving the same results, and now they’re off the mark by almost 20%? Where were the five million chavistas and their children celebrating on the streets? I saw a ‘caravana’ here in Valencia, with about 40 vehicles, and that was it. Where are Luis Tascon, Iris Varela, Cilia Flores, Nicolás Maduro and Juan Barreto right now? If we know them well, we should expect them to rub their victory on our faces, and yet none of them have spoken out. Already working hard on the audit tampering, maybe? And why VTV seemed like a funeral all Sunday? Why the hell – and this has nothing to do with the fraud – JVR and the people’s ombudsman said the Altamira shooting was the demonstrator’s fault? Is it already illegal to protest? Aren’t they getting ahead of themselves? How come at least 16 pairs of voting tables had exactly the same number of SÍ votes? That’s as likely as to hit the Lotto Jackpot, twice. If CNE’s Jorge Rodriguez is so fair, why did he deny the on-the-spot-audit, and is denying a proper audit right now? If he said, after the signature gathering, that there was a reasonable doubt about such signatures, and hence the reparos took place, why the hell he won’t admit a deep audit right now? Why Jorge Rodriguez mentions over and over again that ‘the international observers endorse the CNE results’ and hence there’s nothing left to do? Why didn’t he say such thing when the SAME observers said the signature gathering was fair and all the necessary signatures were there? Why Jorge Rodriguez ordered ALL signatures to be checked, and now is denying a ballot count on a 1% sample? Why both Carter and Jorge Rodriguez say the audits are going to take place, but the results won’t change? Do they have a crystal ball? And finally, why keep the entire country with a reasonable doubt, instead of allowing all the audits the opposition wants, the way they want it, where they want it? Posted in Uncategorized | Etiquetado: Uncategorized | Comentarios desactivados en Some whys, some wheres, some hows.